Tokelau is not just a small county — it’s tiny. It is made up of three small atolls: Atafu, Nukunonu, and Fakaofo. Altogether, there are just 1,400 people in Tokelau. Though most of them are indigenous Pacific Islanders, they’re not all alike. On Atafu, the smallest of the islands, most of the islanders are followers of the Protestant Church. On Nukunonu, the largest of the islands, almost everyone is Catholic. Of course, on Fakaofo, they’re pretty evenly split. The people of Tokelau have come together over a common concern: Sustainability. The islands of Tokelau are very low, at the highest just 5m above sea level. This means that rising ocean waters put their existence at risk in a very real way! There’s not a lot that a tiny Oceanic nation can do to stop the global problem of fossil fuels, but they’ve got to try something, right? 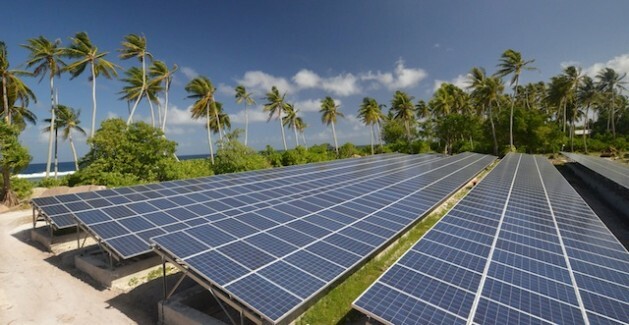 Last year, Tokelau announced that is moving towards an almost 100% dependence on solar power and coconut oil. Just because Tokelau is small, doesn’t mean it is an easy task. There is very limited transportation between the atolls — no airplanes, just boats. Also, the islands experience severe weather conditions throughout the hurricane season, so these solar panels will be built to last!